More than showing a series of unrelated drills, Coach Steele shares an effective blueprint for developing your own drills. Her drills follow a four-stage progression: execution of proper technique, combining multiple skills, adding more players, and using critical thinking skills to make decisions. Using this multi-stage, build-up progression, Coach Steele demonstrates a series of drills that will help you improve all areas of your team's defense. Using nine drills that focus on building agility and footwork while combining a variety of shooting scenarios, Coach Steele covers the essential skills of successful goalkeeping. Drills focus on proper positioning, efficient movement across the goal (arcing, angles and drop steps), kick saves, clearing and hand positioning. 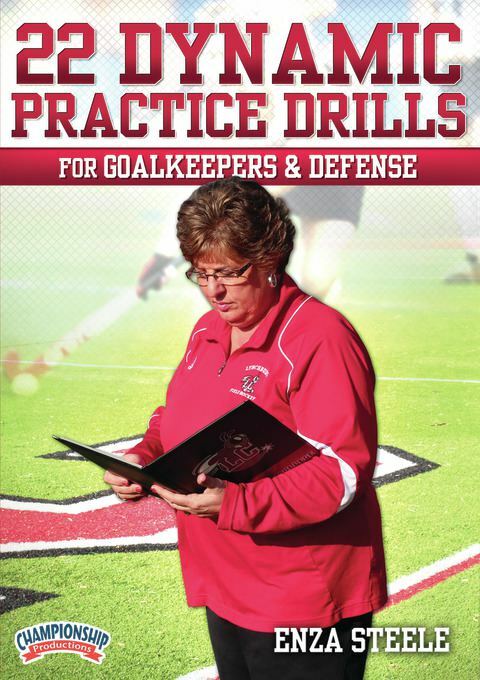 Goalkeepers of all skill levels will be able to improve their technique with Coach Steele's detailed instruction. To develop quick, spontaneous shooting in practice that simulates a high tempo offensive opponent, Coach Steele shares six effective drills designed to allow the attack to maintain continuous shooting against the goalkeepers and defense. By creating a strong attack tempo in practice, the defense will be challenged to meet and train against a game-speed offense. Defenders begin working on their individual defensive body positioning against an attacker. This progresses to defending the circle as the attack enters from different positions on the field. The defense is shown how and where to channel the attack so that they are forced to take shots away from the center, low angle. Use this drill to develop hand-eye coordination, work on transition skills, footwork, elimination skills and more. These drills and exercises will provide less experienced players with a solid foundation from which to build upon. More experienced players will also benefit by using the details that Coach Steele explains throughout the entire presentation.